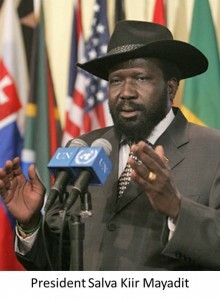 South Sudan President Salva Kiir reports there was an attempted coup on Sunday night in Juba, the capital city. Despite government assurances to the contrary, violence is ongoing and has now spread beyond the capital. According to the latest news reports, more than 60 soldiers have been killed and thousands of citizens of civilians have been forced to flee their homes. 1. A Not So Clandestine Coup by the former Vice President? President Kiir has named former Vice President Riek Machar as the coup leader and published a list of 14 others ring leaders–all former senior political officials and most fired by the President this past June. The violence erupted on December 16, but it looks like the first warning shot may have been fired 10 days earlier on December 6 – from Machar’s Facebook page. After minimal activity over several years, Machar posted a media article titled: “Senior SPLM colleagues give Kiir ultimatum over party crisis.” For the past 48 hours, Machar has continued to post on the progress of the coup, violence and mayhem from an unknown location as Government security forces try to hunt him down. 2. A grab for power by the President himself? Former Vice President Machar, Rebecca Garang and other opposition allies claim they are not responsible for the violence, there has been no coup, and that the violence has in fact been initiated by the President himself as a pretext for hunting down and imprisoning the opposition. The third explanation for the events is that there has been a divide between ethnic Nuer guards loyal to Machar and ethnic Dinka guards loyal to the President, for the Nuer guards launching the coup attempt. Who’s doing the fighting? The Government has a list of 15 individuals it says are behind the coup. But who’s doing the fighting? We hear it’s soldiers, but then why isn’t the Government concerned about mutiny amidst the ranks? And even if the real cause of the fighting is the Presidential Guards, the fighting in the streets and outside of Juba suggests other elements are at play. Even if it the violence is short-lived, South Sudan’s fledgling democracy has suffered a serious injury, and may not survive. President Salva Kiir has made clear his interest in consolidating power. No matter who initiated the violence, the appearance of a coup attempt will give Kiir the justification he needs under the Transitional Constitution to further consolidate power in the name of national security. If the coup-makers find success and take power from President Kiir—which is highly unlikely at this point—it is improbable that they would or could return to democracy. They have the ability to speak out against decrees and policies they objected to and could have waited a couple of years for the next national elections to allow the citizens to have their say. Instead, Machar and his colleagues attempted the violent overthrow of an elected government. The constellation of coup-makers and the public statements made in the past six months all indicate that this is about political power. It may also be about democracy and dictatorship. It is not directly about policy, territory, or ethnicity. But the danger is that the fighting over power in Juba can easily tip over into ethnic conflict . Already, there are reports of ethnically-targeted killings by President Kiir’s majority Dinka tribe against Machar’s Nuer tribe. The President quickly denied this charge, but in the context of conflict, uncertainty and fear, allegations alone have the power to change the nature of this conflict from a ‘place coup’ to a grassroots conflict embroils the population. The leadership of South Sudan’s first government is elected while Southern Sudan is still part of Sudan. In a referendum, 99% of citizens of Sudan vote for the secession of Southern Sudan. South Sudan celebrates its birth as an independent country. The President of Southern Sudan—former rebel leader General Salva Kiir—becomes South Sudan’s first President. President Kiir announces a 50-member Cabinet with 29 ministries. President Kiir issues five decrees that remove senior officials from office, including his entire cabinet, Vice President Reik Machar, and two state governors, among others. President Kiir says he has authority to take this action under the Constitution and his spokesperson said it was necessary in order to make changes and to reduce the size of government. Reik Machar says he will run for president in the 2015 elections. President Kiir announces a new smaller 29-member cabinet with 18 ministries. President Kiir appoints James Wani Igga as the new Vice President. President Kiir says 2015 national elections may have to be postponed due to lack of government funds to conduct a population census and the absence of a new constitution. The fired government officials who are also leaders of the country’s Sudan People’s Liberation Movement (SPLM) Party hold a press conference. Former Vice President Reik Machar reads a statement accusing President Kiir of separating himself from the Party he heads, encouraging inter-regional and ethnic tensions, forming a personal army, and of corrupt leadership. They give the President an ultimatum to related to Party process and accountability. Led by Reik Machar, the fired senior government officials accuse President Kiir of “dictatorial tendencies” and pull out of an SPLM Party leadership meeting. Former Vice President Reik Machar leads a militant coup attempt. 1. General Oyay Deng Ajak. Former Minister of National Security. 2. Maj. General Gier Chuang Aloung. Former Minister of Roads and Bridges. 3. Majak Agot Atem. Former Deputy Minister for Defence and Veteran Affairs. 4. John Luk Jok. Former Minister of Justice. 5. Cirino Hiteng Lofuho. Former Minister of Culture, Youth and Sports. 6. Chol Tong Mayay. Former Governnor of the Lakes State. 7. Ezekiel Lol Gatkuoth. Former Head of Mission at the SS Embassy in Washington DC. 9. Madut Bier Yel. Minister of Transportation and Communications. 11. 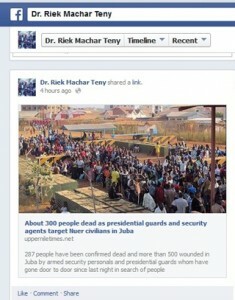 Dr. Riek Machar Teny. Former Vice President. 12. Alfred Ladu Gore. Former Minister of the Environment. 13. Pagam Amum. Former Secretary-General of the SPLM Party. 14. Taban Deng Gai.Former Governor of Unity State, South Sudan. 15. Peter Adwok Nyaba. Former Minister of Higher Education, Science and Technology.